AFS-USA has been the leading, nonprofit organization in intercultural learning and international exchange programs for over 70 years. 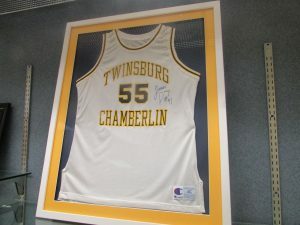 As of the early 1960s though, when the program was barely 20 years old, Twinsburg had never been one of the communities to participate in the program. This changed on August 14, 1963 when Inger Marie Halverson arrived from Torga, Norway and stole the collective hearts of the region. Her year in Twinsburg was spent at the home of her hosts, the Don Gilbert family. Twinsburg’s first foreign exchange student during the 1963-1964 school year. Inger Marie fever quickly spread across the community. Mayor Richard Lippet proclaimed her day of arrival as “Inger Marie Day”, and gave her a key to the city during a ceremony at the Village Hall. Open houses were held at the high school for the region to meet her. There was a the showing of a Norwegian film, a rare occurrence in a small Midwestern village in the 1960s. Inger Marie’s mother sent Norwegian holiday cookies and holiday decorations for all to enjoy, and Twinsburg celebrated Norwegian holidays so Inger Marie wouldn’t feel homesick. She was voted sweetheart of her class at the sweethearts dance in February of 1964, but as soon as the fervor had started it was over. At least to some extent. 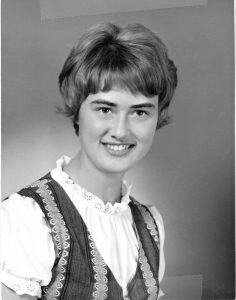 During the following years letters from and news about Inger was often found in the Bulletin, including her graduation in 1966 and marriage to Bjorn Bakken in June of 1971. As the years went by though they became more and more sporadic, ending in the mid 1970s. The Gilbert’s eventually lost touch with her, but for a time in the early 1960s Inger Marie Halverson was the most popular girl in Twinsburg. The City of Twinsburg, though relatively young, is a wellspring of history that also offers comfort and familiarity—an area that has blossomed and evolved to include new housing developments, beautiful parks, and hubs of commerce while maintaining picturesque views worthy of a postcard. These views did not spring up overnight via the whims of mayors and city planners, but evolved with the natural passage of time to shape the cityscape we know today. 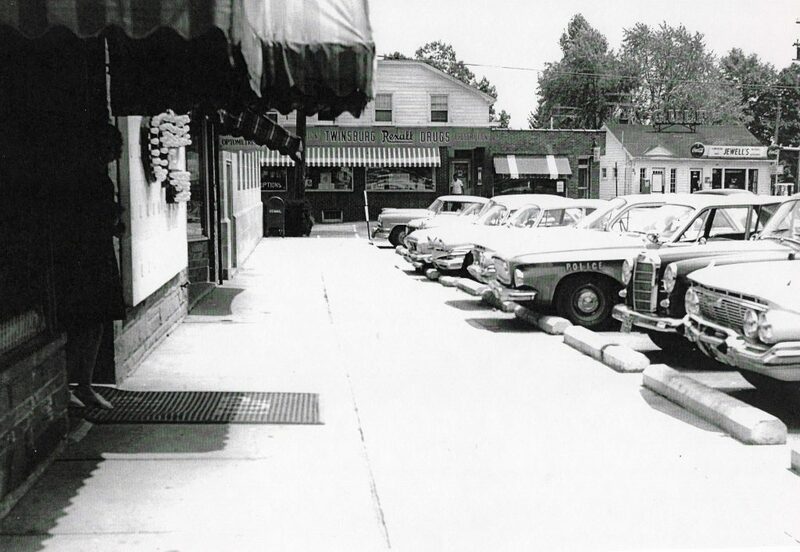 Though it shares nearly 140 years of history with the Township, the city’s own unique history dates back just over sixty years.  Unlike other, older villages and towns that were carved from the woods and fields of an untamed wilderness, the City of Twinsburg was created in the twentieth century by an act of political secession. The need to collect taxes from the recently announced Chrysler plant sped things along, prompting the separation of township and city and bringing jobs, other businesses, and a torrent of taxpayers to the area. Much of the history to come would radiate outward from the square: Twinsburg Institute, Locust Grove Cemetery, family owned businesses, farms, school houses, and church after church sprang up within view. The streets lining the square, always the center of festivities. Richner Hardware, Lawson’s, and Roseberry’s took root one-by-one, providing locals with some of the amenities larger cities had to offer, with the comforts of small town familiarity. No parking spaces to spare on a busy afternoon at the Town Square. When new housing was needed, Glenwood Acres was created to provide it. Lowcost homes, numbering more than four hundred, began springing up in 1956 following the announcement of the new Chrysler plant. Homes would be needed to accommodate the countless new employees looking to minimize their commute to work and keep their families close. Production at the plant would begin in earnest the following year. With each development and each alteration another farm, wooded area, and orchard would fall beneath the wheels of progress. The growing village reached the critical five thousand head count by the end of 1969, allowing it to acquire cityhood. City managers begat mayors, volunteer firemen begat paid firefighters, and mainstays of business gave way to corporations. The 1970s would see two unique milestones come to pass: 1976 would mark the nation’s bicentennial as well as the start of Twins Days, a celebration paying homage to the Wilcox brothers, who laid the foundation for what Twinsburg would come to be. Though it began as a community-centered festival with a parade, food, contests, and a parachuting clown named Thunder Chicken, interest in the event would spread. 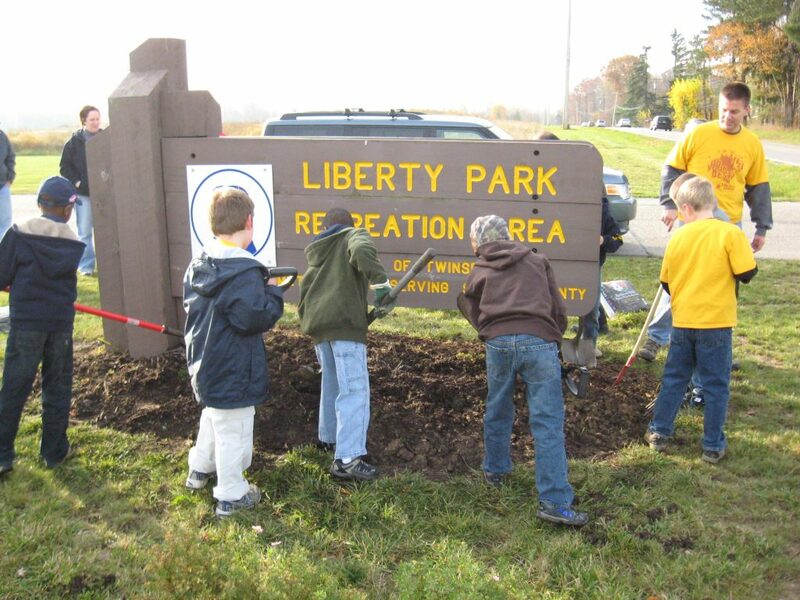 Area children lend a helping hand, planting flowers under the sign to Liberty Park. The new Twinsburg High School opened in January 1999, providing students with a new learning environment when they returned from their winter break. (The “Old School” still stands, though it’s been closed for years.) The park system also received some attention, with Mayor James Karabec securing a letter of intent for the property that would eventually become the three-thousand-acre Liberty Park. The dawning of a new century brought with it many changes: some wanted, some unavoidable. Longtime mainstays like Richner Hardware shuttered their stores in response to big-box stores like Home Depot and Walmart eating away at their customer base. Chrysler, the financial backbone of Twinsburg and employer of many, closed during the summer of 2010. Economic ripples from its closure were inevitable, though the blow to the city’s tax revenues was mitigated in no small part by the foresight of former mayor Karabec, who had set in motion a plan to diversify the city’s income stream, knowing it relied too heavily on Chrysler. Mayor Katherine Procop would continue the work begun by Karabec, helping to secure new tenants and diversify city revenues. Among the new tenants operating out of the Cornerstone Business Park (site of the old Chrysler plant) are an Amazon fulfillment center and FedEx. The Chrysler Plant was the catalyst for great expansion in Twinsburg, with the school system being second to none in its growth. 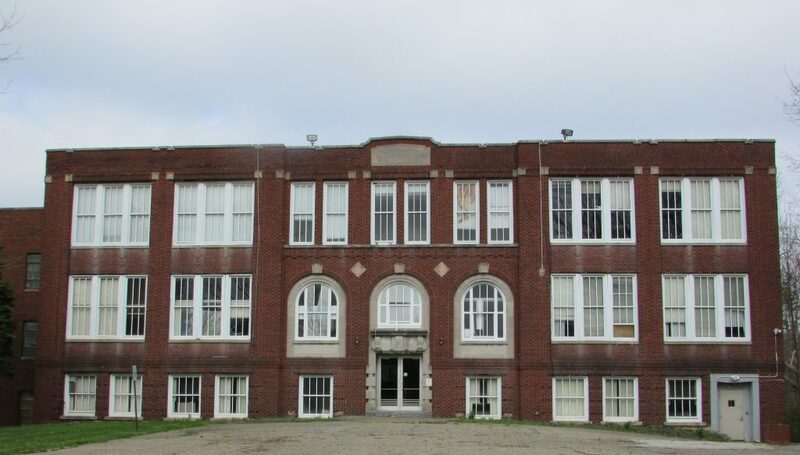 In 1960 the Wilcox Elementary School opened to serve the community and its rapidly expanding student population. Wilcox Elementary Dedication Pamphlet, November 20, 1960. In 1965 a booklet listing the members of every graduating class of Twinsburg from 1895 to 1965.